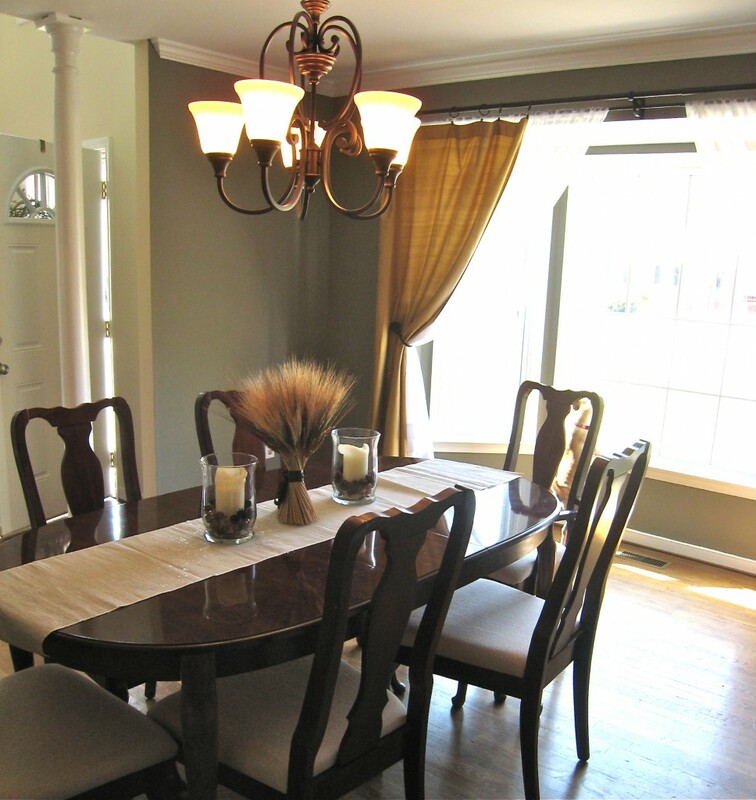 Next to the master bedroom, the dining room was what sold me on our house (even its pre-flipped, dilapidated state). I loved the natural light, the big bay window, the two columns and the way the dining room entry point flowed into the two-story foyer. I knew right away that I wanted to paint the dining room gray. I’d never painted anything gray, but I’d seen it all over the place in home magazines and blogs. A “soft gray” not a dumpster gray, or a chalkboard gray. I also knew I wanted to combine that gray with gold and wheat tones. I’d seen some beautiful wheat-colored silk dupioni drapes in the Pottery Barn catalogue last fall but I knew they were not a typical home decor expense for the Sibigas. So, I began dropping not-so-subtle hints to Tommy that they would make for a great Christmas present. He got the hint. I got the curtains, and during my week off work between Christmas and New Years we officially began redecorating our dining room. It took us three different swatches of gray to finally get it right. The first gray we put on the wall was charcoal, the second gray was a step above a garbage can, and the third gray perfect. “Mushroom” by Martha Stewart. Awkward name, gorgeous color. 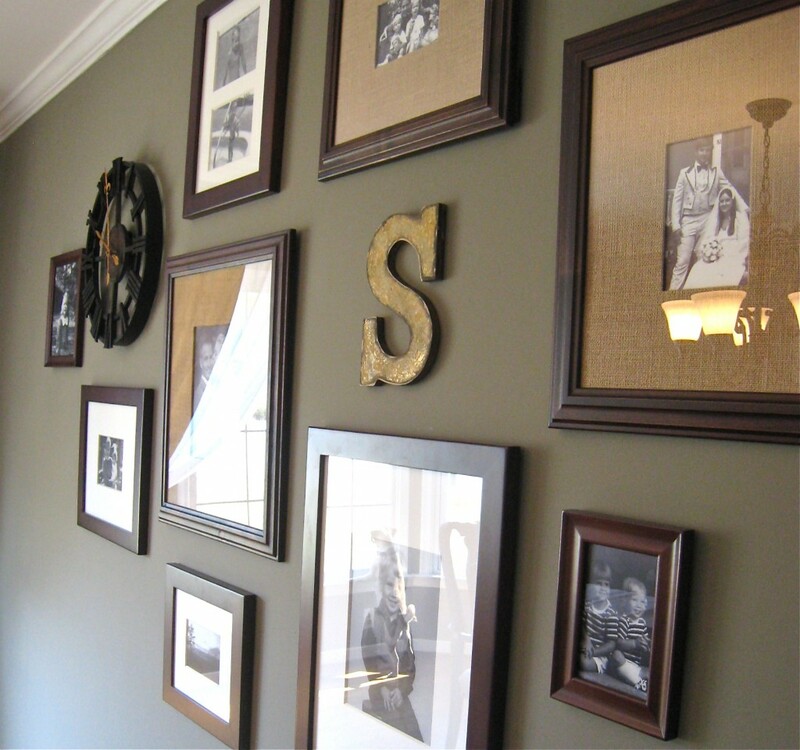 After the paint and the curtains, the next project I was eager to accomplish was hanging a gallery of frames on the largest wall in our dining room. I used some Christmas money to splurge on three wooden frames from Pottery Barn with Burlap matting to match the wheat-colored curtains. 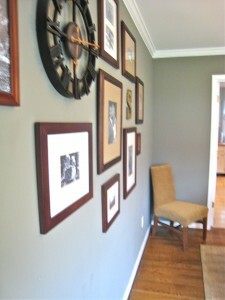 Then I bought four or five other brown wooden frames to match from Target and a very inexpensive black wall clock. We traced all of the frames and the clock on recycled paper, cut out their silhouettes, and taped those silhouettes to the wall to arrange them how we wanted, sans miscellaneous holes in the wall. In the end, Tommy was able to just put a nail right through the recycled paper, rip the recycled paper off the wall, and mount the frames in their place. 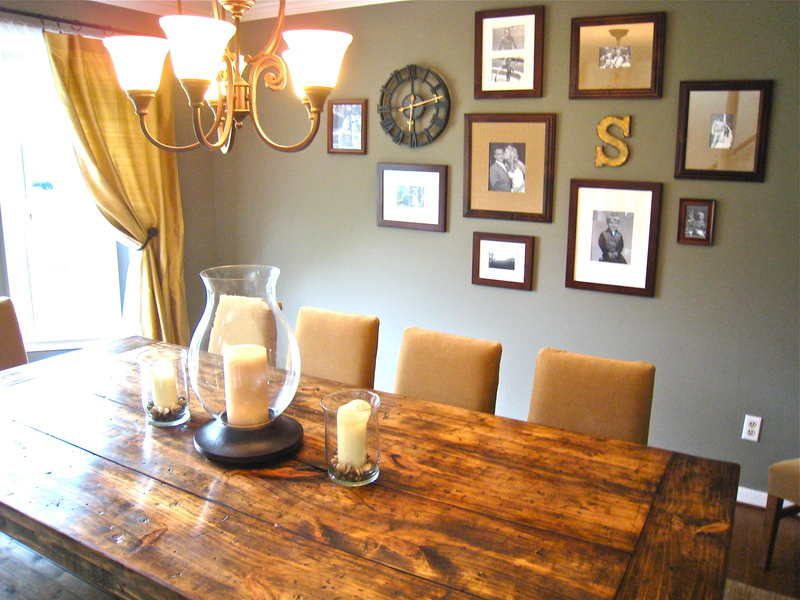 It was the cleanest and easiest frame mounting we’ve ever done. Here’s a current photo of the entire dining room with Tommy’s Farmhouse Table and our “new” Parsons Chairs.